Traditional Native American Healing Traditional healing in tribal societies is often described as shamanism, which is a family of traditions whose practitioners voluntarily enter altered states of consciousness to interact with spiritual entities to heal people who are ill or distressed (Eliade, 1964). Shamanism may be 25,000 years old (Walsh, 1990), and “fully 90% of the world’s cultures make use of one or more institutionalized altered states of consciousness, and in traditional societies these are, almost without exception, sacred states” (Walsh, 1996, p. 101). Practices that induce altered states of consciousness are often considered spiritual healing practices, since they are based on spiritual and supernatural beliefs in tribal societies. However, they can also be seen as psychological healing practices, or even psychotherapies in some cases. The practice of spirit travel (o r soul journeys) by the healer while in an altered state of consciousness distinguishes shamans in the rest of the world from most Native American medicine people. However, there is not necessarily a clear demarcation between shamans and Native American healers, since Native American healers also use rituals and ceremonies that invoke a spiritual realm and utilize altered states of consciousness. For example, according to Sandner (1996) “soul loss” is a major cause of illness among traditional Native American people, and can be equated with depression. Soul loss is thought to be caused when the patient’s soul is separated from the body or possessed by an evil power, resulting in a loss of interest in life. The heal er tries “to cure soul loss by enticing the soul back into the body with prayers and rituals” (Sandner, 1996, p. 147) or by entering a deep trance and traveling into the other world to retrieve the lost soul. This technique was practiced by healers in the Shoshone and Northwest Coast tribes until recent times (Sandner, 1996). The entry into an altered state of consciousness for healing can be facilitated by many practices. To prepare for healing, native healers may go for a day or more without food, sleep, and even water. They may also spend extended time in solitude, contemplation, and prayer, and subject themselves to extremes of temperature in cold streams or hot sweat lodges. Techniques for inducing altered states of consciousness include intense rhythmic stimulation such as chanting, singing, dancing and drumming; any of these techniques may be sufficient to alter the stat e of consciousness of the healer and/or the patient (Walsh, 1996). It should be noted that indigenous healers in North America typically do not ingest hallucinogenic drugs to facilitate their healing ability (wit h the exception of the peyote ceremony in the Native American Church). However, they often utilize other shamanic techniques. For example, among the Plains Indians, the vision quest was the primary means of establishing a link with the spirit world, and was the basis for most healing rituals (Sandner, 1996). While the specific form of the vision quest varies from group to group, it usually involves isolation in a secluded place outdoors, such as on a sacred mountain, without food or water for four days and nights. It is easy to understand that given this preparation and the set and setting of the person pursuing a vision, it is highly likely that a vision would be seen. Another example is the communal ritual of the Sun Dance of the Lakota Sioux, which involves rigorous fasting and dancing and “the intense pain of wooden pegs piercing the flesh of the dancer’s chest and attached by strong cord to the central pole . . . . as the pegs tear through his flesh, the dancer is in ecstatic union with his sun father” (Sandner, 1996, p. 151). Carl Jung’s therapeutic technique of active imagination could be seen as a gentle form of vision quest, without the isolation, deprivation, and pain. In the process of active imagination the mind is stilled, and eventually a spontaneous mental image is allowed to enter awareness. The image is focused on and allowed to play itself out. Afterward, a record such as a drawing or a narrative is made, and finally what is learned from the experience is incorporated into everyday life (Jung, 1997). The idea that altered states of consciousness exist is not controversial; everyone has dreams, and most people have experienced an altered state after ingesting alcohol or drugs. Even children sometimes alter their consciousness by spinning until they are dizzy and drop to the ground. Another example of an altered state is the state of mind produced by meditation. Meditation may have many benefits, including a profound state of relaxation, which can have obvious psychological and physical benefits. Religious ceremonies and rituals (which often involve repetitive chanting, praying, and singing) can also calm, comfort, and reassure practitioners. Probably any mental or physical activity that produces a calm state of mind and/or physical relaxation has health benefits. Altered states of consciousness can be induced by a wide variety of activities, including relaxation, biofeedback, electrical stimulation of the brain, exercise, prayer, religious ecstasy, sensory deprivation, fasting, cold, odors, pain, hypnosis, rapid eye movements, etc. The altered states of consciousness that can be produced by isolation, certain psychoactive drugs, and repetitive behaviors such as chanting, drumming, and whirling have been a respected topic for many y ears in transpersonal psychology (Boorstein, 1980). Many Native American ritual healing practices could be seen as transpersonal because of their spiritual context and because they take advantage of the healing potential of altered states of consciousness. Native American ritual healing methods include several activities that are effective in producing an altered state of consciousness. For example, rhythmic drumming at a certain speed may induce hypnotic trance, as can singing and dancing when done in a ritual context. Sitting on a sand painting to absorb healing energy while the healer chants a ceremony could also induce a receptive state of mind which could facilitate psychological healing. The spiritual context of ritual healing is what makes it transpersonal, but the same activities done in a secular context might be just as soothing and relaxing. Sensory deprivation can alter consciousness, and Barnouw (1985) described a sensory deprivation method of dissociative trance induction used by Canada’s Ojibwa Indians. Sometimes Ojibway boys who were approaching puberty and wanted to become healers would be sent out to an isolated area where they would build a platform high in a tree and lie there and fast in hopes of being visited by a guardian spirit. According to Schumaker (1995, p. 72), “this prolonged period of sensory and nutritional deprivation undoubtedly helped some boys to enter a dissociative trance.” The boys’ reports of their encounters with the guardian spirits were remarkably consistent, and were similar to the stories adult Ojibway healers had told the boys about their en counters with the spirits. In a process of autosuggestion, the boys’ visions fit a culturally prescribed pattern which made the trance state highly meaningful. Both hypnotic trance and possession trance are altered states of consciousness involving mental dissociation. Trance is largely dependent on the subject’s motivation and on the situational and sociocultural context, but ma y be facilitated by certain conditions and techniques. Jilek (1982) found that the altered states produced in the Salish Spirit Dance and the Sun Dance were similar, and he proposed that the sensory stimulation in the dances releases neuro-endocrine opiod agents that produce a peak experience. 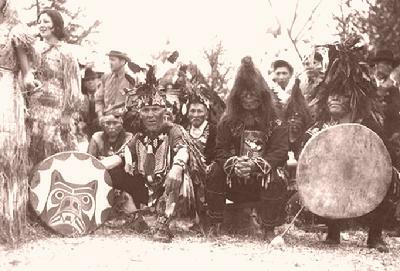 Among the Salish Indians of the Pacific Coast of North America, Spirit Dancing is practiced as an initiation process for young people who are seen as suffering from spirit illness due to alienation from traditional Indian ways. It is used for Salish adults with depression, anxiety, and somatic complaints, and for young people with behavioral,alcohol, and drug problems. The diagnosis is spirit illness (a form of depression), and the treatment is Spirit Dancing (Amoss, 1978). The healer’s job is to “kill” the initiates’ faulty and diseased old selves, to let them awaken with a potential for change, and to guide them on the path of Salish tradition through the teachings of their elders. Th e initiation process has three parts. The first part is depatterning through “shock treatment” which lasts four days. Initiates are secluded in a dark cubicle or “smokehouse tent.” Then several people seize the initiates, restrain them, blindfold them, and hit, bite, and tickle them. The person is subjected to kinetic stimulation (lifted up and dropped, carried around, and whirled about) and acoustic stimulation (loud rapid drumming, rattling, singing, and howling). This process is repeated four times until the initiate is weak, pale, rigid, and appears lifeless on the ground. The initiates are blindfolded for the whole four days, must lie still, cannot talk or move, and have to fast (although they are teased and tested by people holding tasty bits of salmon held close to their mouths). The second part of the process is physical training. There are long daily runs, often barefoot in snow, daily swimming in ice-cold waters, and frequent rounds of dancing to the drums, until the initiates are exhausted. Sometime during the process the guardian spirit is expected to appear in a dream or vision. The drum ming is about three beats per second (180 beats per minute). The third part of the process is indoctrination. This includes the direct teaching of the rules and sanctions of the tribe and the recounting of traditional tribal lore. Finally, the initiates take off their old clothes and get new clothes to signify their new life after the cure of the spirit illness. The old personality is shed and the young person is presented to the pub lic as an adult (Amoss, 1978). Salish Spirit Dancing includes many practices that can facilitate an altered state of consciousness. The depatterning process involves sensory deprivation, sleep deprivation, kinetic stimulation, sonic driving, emotional arousal, and fasting, resulting in hypoglycemia and dehydration. The physical training process includes repetitive dancing, drumming, hyperventilation, in creased motor activity, and exposure to extreme temperatures. This process leaves the initiates in a dependent, receptive state of hyper- alertness, making them highly suggestible to the teachings of the elders regarding how to live in the future. Rhythmic auditory stimulation has long been known to induce altered states of consciousness, whether the means is chanting, singing, drumming, or shaking a rattle (Walsh, 1996). There are several possible explanations for why rhythmic stimulation can facilitate trance states and healing. One is that it may act as a concentration device, reducing the tendency of the mind to wander. Another is that it entrains brain wave patterns, and some studies have found that brain wave patterns of subjects listening to drumming (as measured by electroencephalography)showed auditory driving responses (Walsh, 1996). That is, drumming at a certain frequency entrained the brainwaves of subjects, so that the subjects’ brainwaves changed to match the frequency of the drumming. Since ancient times, some people have believed in the magical power of sound. Incantations such as “Abracadabra” were treated as sacred sounds and used to treat fevers and inflammations. The Sufis use the chanting of the long vowel sounds of a, i, and u in healing. Freud (1915-1917) said that “Words we re originally magic and to this day words have retained much of their ancient magical power” (p. 17). 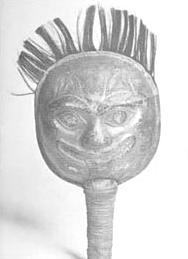 In addition to words, shamans and other tribal healers developed tools for healing, including various types of noisemakers. One interesting example is an instrument used by shamans in the New Guinea Highlands which consisted of two sticks with carved notches, connected to stridulating spikes . The shaman would place the end of each notched stick against opposite ears, and an assistant would scrape along the serrations with the spikes, creating patterned sounds. When used, as was customary, with sensory deprivation and hallucinogenic plants, the sticks were said to communicate messages from spirits. Similar objects have been found in Asia, Africa, and the Amazon rainforest, and all may have served the same purpose (Toop, 1999). Although sensory deprivation can facilitate trance, sensory bombardment can also facilitate trance. According to Schumaker (1995, p. 67), “throughout the ages, many indigenous cultures have made use of repetitive drumming, chanting, or dancing as a means for people to become absorbed and to enter into trance. 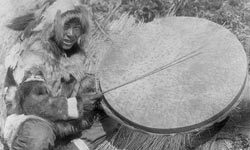 This then paved the way for the effective use of shamanistic healing techniques.” Native Americans have used drumming (sonic driving) as a method for inducing trance for hundreds of years. Shamans go into self-hypnotic trances, and the rhythm of the drum takes them on a journey. Many shamans’ drums are made of horsehide, and the shaman “rides” the spirit horse into the spirit realm (Eliade, 1964). Repetitive and monotonous songs and dances are common in shamanic and Native American ritual. (Ash, 2001, p. 141). One research study found that major brainwave changes were produced in subjects listening to rhythmic drumming when the frequencies were changed (e.g., from two beats to four beats per second) (Villoldo & Krippner, 1987). The altered state was enhanced by exertion, hyperventilation, and fasting, and all of these conditions are present in various NativeAmerican dances. Other studies have found that drumming at three to four beats per second produced characteristic brainwave changes as measured by an EEG (Torrey, 1986). Doak (2007) measured brainwave patterns in subjects who listened to shamanic drumming versus non-shamanic drumming; fMRI analysis showed activation in the occipital lobe that is similar to that of light Stage 1 sleep. There is no consensus on how fast the drumming must be to induce an altered state, with various authors claiming that the pace must be between 160 to 220 beats per minute, between 200 to 210 beats per minute, or about 300 beats per minute (Ash, 2001). Schumaker (1995) said that analyses of various drum recordings from non-Western religious ceremonies tend to show that ” hypnotic” drumming of this sort has a mean frequency of about 180 beats per minute. Another author said that Native American ceremonial drumming is often in the region of 240 to 420 beats per minute, the same frequency as theta brainwaves (Waterfield, 2002 ). One may conclude that certain patterns of drumming facilitate entry into a dissociative state. Since hypnotic trance is a subjective state of consciousness, it is likely that rapid drumming anywhere from 160 to 400 beats per minute, continued for several minutes, can induce an altered state of consciousness in people who are motivated to experience such a state. Walsh (1996) said that “when a drum is played at a tempo of about 200 to 220 beats per minute, most Western novices report that they can journey successfully, even on their first attempt” (p. 98). He speculated that drumming facilitates altered states by focusing attention and drowning out distracting stimuli. The focused concentration produced by rapid drumming is, in effect, a state of trance. The rhythm of shamanic drumming is similar to the rhythm of modern “trance” or “rave” music. Faith healing ceremonies in some fundamentalist churches also use rhythmic singing and clapping to induce trance (Torrey, 1986). It is well established that visual stimuli can be used to induce a hypnotic trance. For example, one traditional method to hypnotize a client is simply to have the person stare at a spot high on the wall of the room. There are other visual techniques that could potentially be used to induce an altered state of consciousness, such as staring at a rotating optical illusion, or even just closing the eyes and pressing lightly on the eyeballs, which causes the sensory cells to fire, creating flashes of light. There is a long history of flickering light being used as a way to stimulate trance. Perhaps even primal humans were entranced by the flickering light of a camp fire, and perhaps this effect explains why many people like to watch a fire today. Schumaker (1995) said that in many cultures ceremonies often involve chanting, rhythmic dancing, and excited crowd activity around ceremonial fires; “When performed at night, there is frequently a stroboscopic effect wherein darkness is punctuated by light when bodies move in front of the fire. This alone goes a long way toward trance induction” (p. 98). Stroboscopic photo-stimulation produces “photic driving,” the alpha type of brain electrical activity associated with an altered state in which people are susceptible to suggestion. Two hundred years ago the physiologist Jan Purkinje described how stimulating the eyes with a flickering light produces a visual field full of hallucinatory geometrical patterns, accompanied by various emotional reactions. In his book Heaven and Hell (1956), Aldous Huxley mentioned the role of flickering light in initiating and intensifying altered states of consciousness. He believed “the experience evoked by the stroboscope was linked to the interference of the rhythm of the lamp with the electrical rhythm of the brain” (Geiger, 2003, p.37). In the 1960s several people became interested in constructing flicker devices that were less expensive than the stroboscope. Brion Gysin and Ian Sommerville constructed a device they called the Dream Machine. The device was “a white cylinder about a meter in height, its interior lit by a 100-watt light bulb so that light shown from slots” cut in the cylinder . . . “As the Dream Machine spun slowly on a turntable . . . it produced stroboscopic pulses of light at a rate which corresponded to the alpha band of some eight to thirteen flickers per second” (Geiger, 2003, p. 3). The machine was meant to be the first art object to be seen with closed eyes. When standing close to the device with closed eyes, users reported “seeing” brilliant colors, geometric patterns, mosaics, and textures (Geiger, 2003). After using the machine, many people reported feeling clear-headed, aware, and serene. It is likely that use of the stroboscope, Dream Machine, and similar flicker devices produces ambiguous visual stimuli, similar to the ink blots of Rorschach’s test. Exactly what is seen by a particular user could potentially be interpreted to reveal contents and complexes in the user’s subconscious or unconscious mind. Several commercially available devices take advantage of the consciousness-altering potential of stroboscopic light. Usually called “mind machines” or “sound and light entrainment devices” these devices look like opaque goggles with headphones, but they have tiny diode lights inside that can flash in various patterns. There is some EEG research that supports the idea that photic driving (flashing lights in the 6-18 Hz range) provokes an altered state of consciousness (Glickson, 1986-87). Participants in raves sometimes seek an ecstatic state of mind by dancing to trance-like music in a room with flashing lights. Explanations of How Ritual Healing Helps Traditionally, Native American healers have often used ritual healing ceremonies to treat psychological problems (Hultkrantz, 1992). While the traditional healer would explain the effectiveness of the ritual as due to its spiritual power (Winkelman, 1992), more scientific explanations are possible. Rituals and ceremonies can have great healing power because they can reduce anxiety and distress, relax the body, reconnect the person to their community, and possibly mobilize internal healing mechanisms such as the release of endorphins, the body’s natural pain killers (McClenon, 2002). Ritual healing techniques operate symbolically; that is, rituals and ceremonies involve the manipulation of symbols (words, ideas, beliefs, art, myths, etc.) to benefit the client (Sandner, 1991). While counselors and psychotherapists use words and ideas to facilitate change in clients, traditional healers use rituals and ceremonies that incorporate the spiritual beliefs, art, or mythology of their specific tribe. Both ritual healing and psychotherapy pair a healer with a client and involve the manipulation of symbols for the purpose of relieving the client’s distress. “The medicine man is basically psychotherapist” (Hultkrantz, 1992, p. 3). Although no rigorous research has been conducted in this area, there are many anecdotal reports that traditional ritual healings do work (Cohen, 2003; Mehl-Madrona, 1997; Kalweit; 1992). By “work” what is usually meant is that the client or patient feels better after the ceremony and is more capable of resuming their role in the tribe. Ritual healings seem to work best on psychological dysfunctions, such as anxiety, depression, guilt, and many types of pain, which is an inherently subjective complaint. Contemporary psychologists tend to see ritual healings within a naturalistic paradigm, and say they can easily be explained by hypnosis, the power of belief, expectations, and other nonspecific effects (McClenon, 2002). This explanation would appear to be the simplest, since it does not require postulating the existence of supernatural forces, which cannot be demonstrated and have to be taken on faith. Referring to hypnosis, trance states, and dissociation states, Torrey said “Although little used in most Western forms of psychotherapy, altered states of consciousness are one of the most commonly used and most powerful techniques of therapy in most of the world” (1986, p.93). Eliade (1964) described shamanic practices in many tribes worldwide that include trance, suggesting that hypnosis is a key component of indigenous healing. Milton Erickson, America’s foremost hypnotherapist, defined trance as what happens when one has an inner focus of attention (Erickson,1980). This is a much broader definition of trance than the standard definition, since it can include everything from introspection, imagery, and relaxation to self-hypnosis, informal hypnosis, and formal hypnosis. Erickson studied the trance phenomenon in other cultures, and wrote “The Chinese, Hindus, Greeks, Egyptians – all had temples where suggestion and hypnosis were administered to lessen hurt and suffering. Undoubtedly, there are ancient civilizations yet-to-be-discovered that used hypnosis expressed in magical sleep, rites, and incantations (Erickson, 1970, p. 71). He commented on ritual trance in Bali, Haiti, Puerto Rico, and Brazil, saying that he viewed the ritual trances as essentially the same phenomena as hypnosis (Richeport, 1985). It has been reported that hypnosis was used in therapy three thousand years ago in China, and is used today by Sufi practitioners in Afganistan. It has also been used by Apache and Washo Indian healers as a therapeutic method (Torrey, 1986). The Ojibway Indian healers, in the Great Lakes area of North America, often use chanting, rattles, and rhythmic drumming to engender trance in the healing process (Grim,1983). Few Western systems of counseling and psychotherapy have utilized techniques to induce altered states of consciousness, with the exception of hypnosis. It may be that the association of altered states with intoxication makes them seem disreputable. This view is unfortunate, since the healing potential of altered states for psychological disorders is well established. Meditation can induce trance, as can focusing on one’s breathing or chanting a mantra or other words. Hypnotists use a steady, measured tone of voice to induce hypnosis. Almost all methods of inducing trance involve rhythm, which, like music and dancing, is a function of the mammalian brain, the limbic-hypothalamic system, rather than the cerebral cortex. It may be that synchronizing brainwaves with external stimuli such as music or light is fundamental to all altered states of consciousness (Waterfield, 2002). Thus, both hypnosis and ritual healing use rhythm to increase suggestibility. Many methods for inducing altered states of consciousness have been used for millennia to facilitate healing. While the use of mind-altering plants and drugs is a quick route to an altered state, Native American healers have utilized a wide variety of other methods, including sonic driving through the use of chanting, singing, and drumming, and the use of fasting, sensory deprivation, and exposure to extreme temperatures. When combined with specific suggestions in the context of a healing ceremony, patients often enter an altered state which may be seen as a hypnotic trance. Thus, Native American healers use quasi-psychotherapeutic methods to help their patients develop a new perspective, resolve their distress, and rejoin their community. music or light is fundamental to all altered states of consciousness (Waterfield, 2002). Thus, both hypnosis and ritual healing use rhythm to increase suggestibility. Ash, S. (2001). Sacred drumming. New York: Sterling Publishing Company. Amoss, P. (1978). Coast Salish spirit dancing. Seattle: University of Washington Press. Barnouw, V. (1985). Culture and personality. Homewood, IL: Dorsey Press. Boorstein, S. (1980). Transpersonal psychotherapy. Palo Alto, CA: Science and Behavior Books. Cohen, K. (2003). Honoring the medicine. New York: Random House. Doak, B. (2007). Effects of shamanic drumming on anxiety, mood, states of consciousness, imagery, and brain patterns in adult subjects. Dissertation abstracts international, 67, #9-A, 3215. Eliade, M. (1964). Shamanism. Princeton, NJ: Princeton University Press. Vol. 1: The nature of hypnosis and suggestion. New York: Irvington. Erickson, M. H. (1970). Hypnosis: Its renascence as a treatment modality. American Journal of Clinical Hypnosis, 13, 71-89. Freud, S. (1915-17). The complete introductory lectures on psychoanalysis (J. Stachey Ed. & Trans.). The standard edition of the complete psychological works of Sigmund Freud (Vols. 15 & 16). New York: Norton. Geiger, J. (2003). Chapel of extreme experience: A short history of stroboscopic light and the Dream Machine. Brooklyn, NY: Soft Skull Press. Glickson, J. (1986-87). Photic driving and altered states of consciousness. Imagination, Cognition and Personality, 6, #2, 167-182. Grim, J. A. (1983). The shaman. Norman, OK: University of Oklahoma Press. Hultkrantz, A. (1992). Shamanic healing and ritual drama. New York: Crossroad Publishing Company. Huxley, A. (1956). Heaven and hell. New York: Harper. Jilek, W. G. (1982). 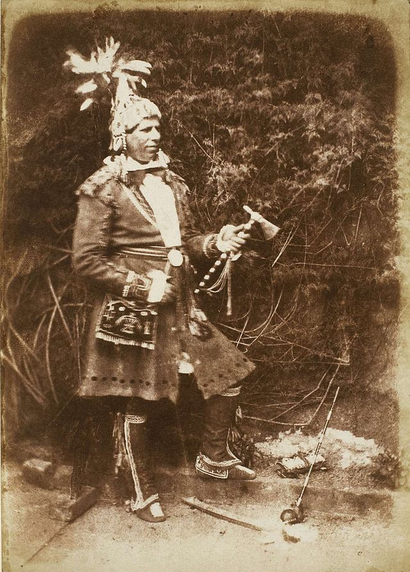 Altered states of consciousness in North American Indian ceremonials. Jung, C. G. (1997) (Chodorow, J., Ed.). Jung on active imagination. Princeton, NJ: Princeton University Press. Kalweit, H. (1992). Shamans, healers, and medicine men. Boston: Shambhala Publications. McClenon, J. (2002). Wondrous healing: Shamanism, human evolution and the origin of religion. DeKalb, IL: Northern Illinois University Press. Mehl-Madrona, L. (1997). Coyote medicine. New York: Scribner. Eriksonian Psychotherapy (Vol 1) (pp. 537-552). New York: Brunner/Mazel. Sandner, D. F. (1996). Native North American healers. In, Scotton, B. W., Chinen, A. B., & Battista, J. R. (Eds. ), Textbook of Transpersonal Psychiatry and Psychology. New York: BasicBooks. Pp. 145-154. Sandner, D. (1991). Navajo symbols of healing. Rochester, VT: Healing Arts Press. Schumaker, J. F. (1995). Corruption of reality. Amherst, NY: Prometheus Books. Toop, D. (1999). Ocean of sound. London: Serpent’s Tail. Torrey, E. F. (1986).Witchdoctors and psychiatrists. Northvale, NJ: Jason Aronson, Inc.
Villoldo, A. & Krippner, S. (1987). Healing states. New York: Simon & Schuster. Walsh, B. B. (1996). Shamanism and healing. In B. Scotton, A. Chinen, & J. Battista (Eds. ), Textbook of transpersonal psychiatry and psychology (pp. 96-103). New York: Basic Books. Walsh, R. (1990). The spirit of shamanism. Los Angeles: Tarcher.Waterfield, R. (2002). Hidden depths. New York: Brunner-Routledge. Winkelman, M. J. (1992). Shamans, priests and witches. Tucson, AZ: Arizona State University.